Donald Trump's insistence that Mexico would pay for the wall is, in fact, older than his presidential campaign. It was at an event in New Hampshire covered by Paul Steinhauser of NH1 News, targeting the state which, as it turns out, would provide Trump with his first victory in electoral politics. But at the time - despite Steinhauser's accurate assessment that it wasn't - it seemed like a joke. The TV guy was going to build a wall for free, huh? Okay. Good luck. That is salient in the moment because of the ongoing government shutdown that stems from Trump's insistence that the American - not the Mexican - government would pick up the tab. He went further in comments to reporters on Wednesday, claiming that his frequent assertions that Mexico would pay for the wall were always meant to suggest an indirect payment, just like the assertion above. "When during the campaign I would say, 'Mexico's going to pay for it,' obviously I never said this and I never meant they're going to write out a check," Trump said. "I said they're going to pay for it. They are. They are paying for it with the incredible deal we made, called the United States, Mexico and Canada - USMCA - deal." "Mexico's going to pay for the wall, believe me," he said during a speech in Los Angeles. "You know, a lot of politicians have said, 'Oh, they're, not going to pay, he must be -" They don't know anything about - they never read 'The Art of the Deal.' "
"People say, 'Oh, how will you get Mexico to pay?' " he said. "A politician - other than the people on this stage, I don't want to - a politician cannot get them to pay. I can. We lose, we have a trade imbalance of $50 billion a year. Believe me, the wall is peanuts by comparison." "CNBC extended their debate by one hour, two days before. . . . And who's the one that said, 'No way, you're not going to do it.' I did. I could stand up there forever, but I said, 'You're not going to do it,' " he said at a rally. "And everybody told me, everybody - 'This is like the wall.' Everyone says, 'Oh, you'll never get Mexico to pay for the wall.' "
8. March 31, 2016. Method: Mexico would cut a check - or the U.S. would "compel" the country to pay. "I have these clowns in the back, these pundits," Trump said at a rally. "And they're saying, 'Mexico's never going to pay for the wall.' Mexico - do you know how much money they make from us each year? And I'm not including with the drugs. I'm leaving that out." "I don't feel like waiting a year or a year and a half. We're going to start building," he said. "Mexico in some form, and there are many different forms, will reimburse us, and they will reimburse us for the cost of the wall. That will happen, whether it's a tax or whether it's a payment - probably less likely that it's a payment. But it will happen." "I've always said we have to have a wall. I've also said Mexico's got to pay for it - sometimes you know on occasion, I'd add who's going to pay for it? Mexico. Well they will pay for it, OK?" Trump told the Wall Street Journal. "There are many forms of payment. I could name 10 right now. There are many forms of payment, I didn't say how." "They make all of this money, and they do absolutely nothing to stop people from going through Mexico from Honduras and all these other countries - the caravan, all of this stuff - they do nothing to help us. Nothing," Trump said. "They're going to pay for the wall, and they're going to enjoy it. Okay?" 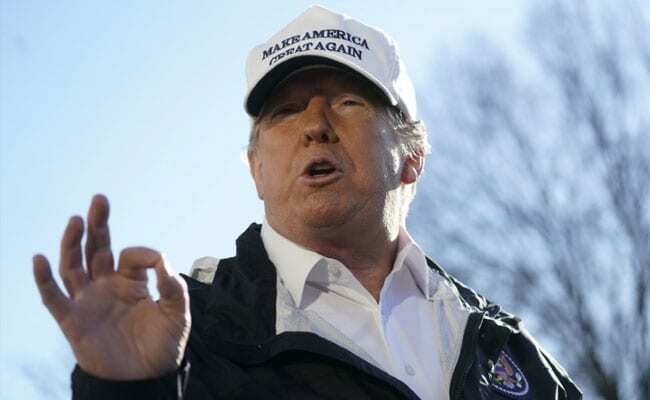 "What we save on the USMCA - the new trade deal we have with Mexico and Canada - what we save on that, just with Mexico, will pay for the wall many times over just in a period of a year, two years and three years," Trump claimed at a news conference last week. "So I view that as, absolutely, Mexico is paying for the wall."